England will be considered outsiders for both the World Cup and the tri-series with Australia and India that precedes it, but that can be a good place to start. When they begin the tri-series against Australia in Sydney on Friday - the same opponents with whom they open their World Cup campaign on 14 February - there will not be too much pressure or expectation. That comes from England's poor one-day international record in recent times, a sequence of only five wins in their last 16 completed games. However, a player free from the burden of expectation can often find himself in a much better position. You are free to simply go out there and get on with the job. That can be more comfortable than when you are expected to win all the time. But, that is not the only reason for England to be cheerful, as their performances in the warm-up wins over an Australian Capital Territory XI and the Prime Minister's XI proved. Ian Bell has been restored to open the innings after Alastair Cook was removed as captain and looks more suited to that job when not asked to play the role of aggressor, as he was alongside in Cook. Bell has all the shots to prosper in limited-overs cricket, as his 187 from 145 balls against the Prime Minister's XI showed. Now, with Moeen Ali - or Alex Hales - as his opening partner, Bell has the luxury of playing himself in, rather than the pressure of hitting the ball in unusual areas during the power play. 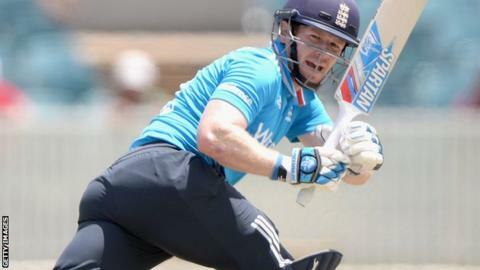 With the top seven now looking likely to be Bell, Moeen, James Taylor, Joe Root, new captain Eoin Morgan, Ravi Bopara and Jos Buttler, England have settled upon a good combination. They have players who can adapt to the situation, which is what 50-over cricket is all about - plotting your way to the biggest total depending on what situation you find yourself in. Like the batting, the bowling slots also seem to be filled, so long as England can get James Anderson and Stuart Broad match fit after the knee problems that kept both out of the tour to Sri Lanka. Broad took four wickets against the PM's XI, but Anderson sat that game out, with Morgan suggesting that the Lancashire bowler may miss Friday's game. If and when both are fit, Chris Woakes seems to be ahead of Chris Jordan and Steven Finn, with James Tredwell providing his dependable off-spin. The tri-series should then give England the opportunity to hone their death bowling, an incredibly difficult part of the game now only four fielders are allowed outside the 30-yard circle. Moeen Ali, James Anderson, Gary Ballance, Ian Bell, Ravi Bopara, Stuart Broad, Jos Buttler (wk), Steven Finn, Alex Hales, Chris Jordan, Eoin Morgan (capt), Joe Root, James Taylor, James Tredwell, Chris Woakes. They can form all sorts of plans, plans that we've all seen before, but it boils down to being able to bowl to the field you have set. If you can do that, all that is left is to keep your cool when the big-hitters are smashing it out the ground and hope for the bit of luck that will bring you a wicket. After that, you really apply the screws to the new batsman. In addition to this, England have to make sure that their fielding is razor sharp. Put simply, a poor fielding side will not win the World Cup, so Morgan's men have to make sure that every catch is taken and as many runs as possible are saved. This is all down to practice. Get out there, under the floodlights, and get used to catching the white ball. Know where you will be fielding - be it point, third man or long on - and be familiar with the angle at which the ball will reach you, what the bat looks like, the best way to attack. If England can do all this, the tri-series should provide an excellent opportunity to be well-drilled for the World Cup, as well as the chance to get on top of a very good Australia side - which itself won't be easy given what happened the last time they were down under. That all leads to the tremendous occasion of England's first game of the World Cup against the Aussies in the cauldron of the MCG on Valentine's night. Jonathan Trott's return to England colours is a "fantastic story"
They won't be expected to win, but, if they do, it would be a sensational start. After that, the minimum expectation would be for England to reach the quarter-finals - there will be big trouble if they don't - and, from there, they are only two wins from the final. Away from the World Cup, many have noted Jonathan Trott's performance this week, scoring an unbeaten double hundred for the England Lions against South Africa. Inevitably, the talk is of Trott returning to the Test side, but that would pose the question of where he would bat, given that the England middle-order seems to be settled. Some have spoken of Trott opening the batting alongside Cook, given that Sam Robson has failed to make that place his own. The idea of Trott opening isn't a new one, but England haven't gone down that road in the past and it would be a huge call to do so now after what he has been through. Ultimately, number threes should be able to open - they could be arriving at the crease after only one ball of the innings - so there is no reason why Trott, or Gary Ballance for that matter, shouldn't open. For now, though, Trott has to continue doing what he is doing. He has had a lot of support from within the game, so many people will be delighted at what he is achieving. It is a fantastic story.